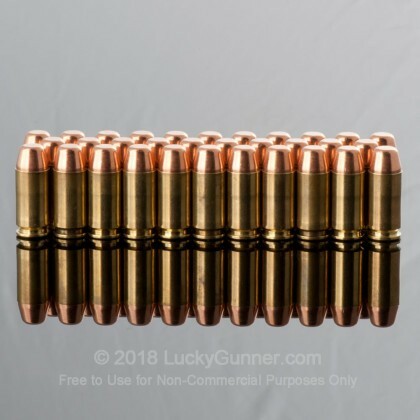 These remanufactured .40 S&W cartridges from MBI (Military Ballistics Industries) utilize once-fired brass casings and copper-plated projectiles in order lower prices and to help keep duty and carry guns running! 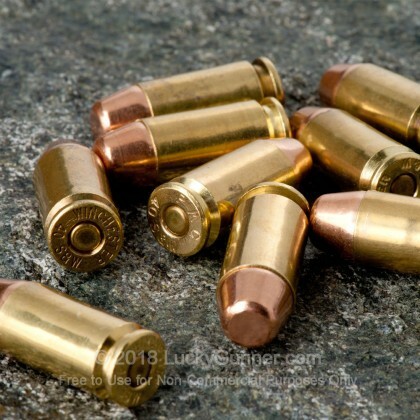 MBI sources their bullets from Berry’s who are well known for “double-striking” or reshaping their bullets after they’ve been plated; this results in a uniform copper layer that not only feeds without shedding but is harder than conventional plating. As a result, shooters need not worry about excess bore fouling or a loss a stability at high velocities. The projectiles weigh in at 165 grains each which is a common light weight of the .40 Smith & Wesson caliber that offers dependable cycling, light recoil, and an easily learned point-of-aim. MBI inspects their once-fired brass casings for strength and defects before subjecting them to careful cleaning and polishing. Each case is then equipped with a clean-igniting Boxer primer from CCI or Winchester and loaded with top grade propellant from Hodgdon. Military Ballistics Industries makes training ammo here in the US utilizing once-fired brass that comes from law enforcement shooting ranges. This huge cost-saving measure helps MBI make quality training ammo at an affordable price. Each round features a non-corrosive primer and a lead core, copper-plated bullet. 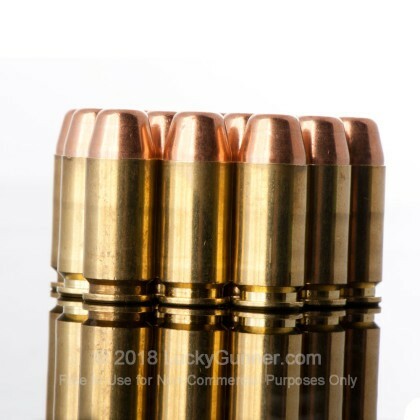 Copper plating is similar to a full metal jacket, but it completely encases the bullet, so there's no exposed lead on the base. Because plating is much thinner than a traditional jacket, you can't use plated bullets with a ported barrel, or the ports can sheer off the plating. Otherwise, copper-plated bullets function just fine, and most shooters never notice any difference. MBI ammo could be considered reloaded, but it's a couple of steps up from what you can do at home on a consumer reloading press. All their ammo is assembled using precise automated reloading machines, very similar to the way factory-new ammo is made. And each loaded round is inspected by hand. When I first heard about MBI, I was a little skeptical. But every batch we've reviewed so far has performed great, and this one was no exception. 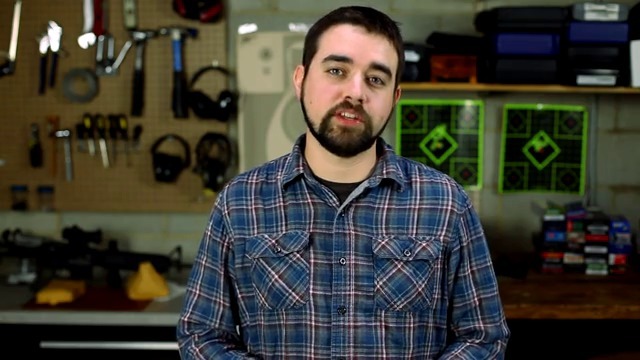 Accuracy was decent, and we had no failures of any kind in our six test pistols. 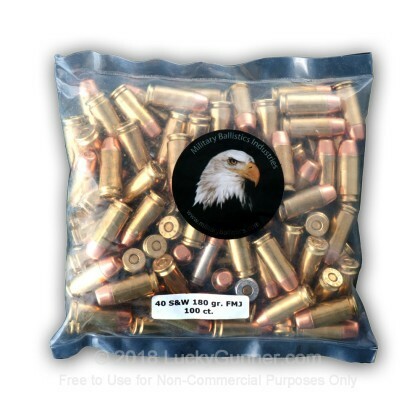 Ammo from MBI should work for just about any range or training application. And if you have any doubts about its performance, be sure to check out the customer reviews on the website. After 100 rounds, my Ruger SR40 and my wife's 40S began to have multiple FTF's and FTE's due to heavy residue from this ammo. Disassembled and cleaned both guns on range then after another 150 rnds, had to clean both guns again. We were both using different boxes out of the 1000 rnds I bought. I won't make the same mistake twice. I'll just have to muddle through the rest of the 650 or so rounds. LG got the order to me quickly so no complaints against them. Bought 1,000 rounds and so far have put about 500 down range. Of that 500, 1 primer didn't fire and one other had a wrinkle in the casing causing it to jam in my Glock G22. I am impressed as far as remanufactured ammo goes. My personal decision going forward, I think I will pay the extra $0.02 per round and go with new ammo. Great ammo for SC 40 !!! I have shot several different brands in my XD 40 SC. This stuff works great. Has a little less kick than other ammo. Perfect for the SC models. Shot 10 rounds at 10 yrds into a 2 inch circle. Can't ask for more than that. Shot 3 rounds at 25 yrds. All hit an 8 x 11 target. This was all shot with the 3" barrel XD SC 40. 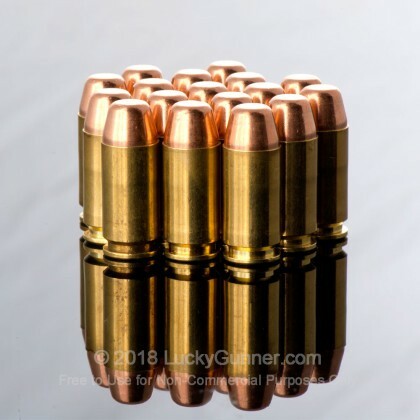 I spend a lot of time on the internet looking for the cheapest ammo available, you may find a one time deal for less money but Lucky Gunner is consistently the best . Buy this if your popping targets or just shooting for the heck of it. If your looking for Home defense get yourself a Mossberg 12 Auto or Pump. Lucky Gunner has some great price's on 12 ga buck. O buy the way I'm retired with lots of time on my hands so I get to check out all the internet Ammo sites. This is a great value for the price, over 300 rnds fired so far with no failures. It is also very clean for the price. You cant for wrong with great value and fast shipping. 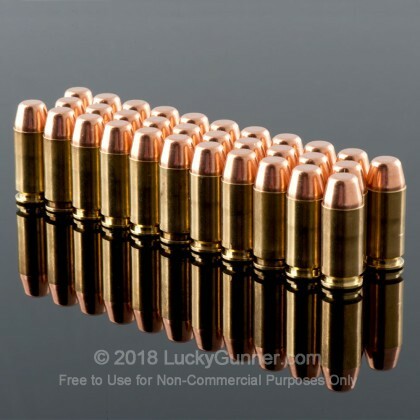 No reason to pay more for practice ammo. Works great in a Glock or HK. First time buyer of this ammo and I am not disappointed. Shipping was amazingly fast. Several broken bags and the shipping box barely made it. Put 200 rds thru my XDM without a problem. No more WWB for me! I've fired 300 in a Glock 22 with no problems. Can't think of a reason to pay more. Packageing could have been better as 2 packs were broken and the box was about to go. So far I have put close to 2K rounds through three different weapons: XDm, Glock 27 and High Point JCP. There has not been one misload, jam or misfire. The best surprise is these rounds are very, very clean firing. My bores are still shiny after a few hundred rounds. I ran out of MBI at the range one day and bought some PMC which fogged out my laser sights within 20 rounds from the GSR deposits. I do not have to wipe my lasers after 300 rounds of MBI. Great Stuff!!! Repeat customer - Bought 8K rounds (180 grain) on this order. The Ammo functions as well as new factory ammo. Shipping is quick (about 3 days) and customer service is outstanding. If u enjoy shooting and want to have a good Target round u can't beat this stuff no problems what so ever quick delivery and great ammo. I've always shot wwb for Target but not anymore. I just bought a Smith & Wesson M&P 40 and wanted a lot of ammo so my girlfriend and me could learn to hit that bulls eye everytime, I would not hesatate to buy this again. I have put about 500 rounds through and only one would not chamber. Thanks Lucky Gunner. 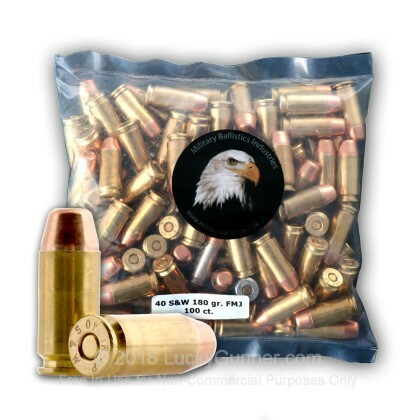 Great Ammo adn Great Price. Fired 70 rounds through PT140 without any problems. Received this ammo quickly. Have not had a chance to fire it as of yet. I had recently bought 1000 rounds and out of the 700 rounds I have shot no misfires occurred! I am pleased to say that I received quality ammo at a more than fair price. Couldn't ask for anything better. THANKS LUCKY GUNNER! Recieved ammo within 3 days, was able to track the shipment. Ammo shoots great. I've run about 300 rounds through my XDM and had one FTF. Every other round has gone bang and hit the target with the accuracy you would expect from a reload/target round. It is a little dirty, but no more so than UMC or WWB. Would not hesitate to use it again. Gone through 500 rounds in my xd40 no problems yet,will buy again!! I have run about 70 rounds through a 31 round extended mag Keltec Sub 2000 40 cal. without any problems except for the holes in the targets including several thin metal plates. It did not go through 1/2 inch metal plate as I expected. The only negative is all the brass is not the same color, but this is not the business end of the bullet anyway.Thanks for the fun!